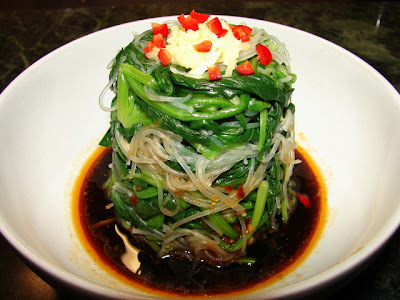 Here is another Sichuan style salad with spinach and glass noodles, eaten warm or cold. Simple and refreshing vegetarian. Moulding with a cup makes a nice presentation as a starter. This recipe is enough for 2. Soak glass noodles then blanch in boiling water briefly till softened. Drain and cut with scissors into shorter length. Blanch spinach till wilted. Drain and lightly squeeze to release water. Cut into shorter length if necessary. Mix spinach and noodles with ginger and sesame oil. Stack all in one bowl or individual bowl. For a nicer presentation, mould with a cup first. I used a yogurt cup as mould. 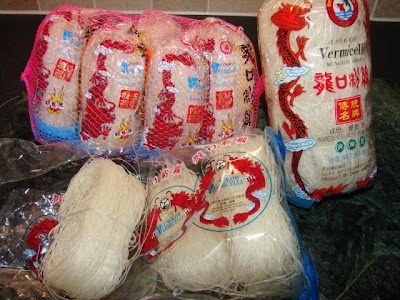 Glass noodles. I always buy the LungKow brand, with two red dragons logo. Various packings. These are what I got in my cupboard now. One large, one multipack (as opened) and one individual wrapped multipack. For this recipe I used just one small bundle. This looks delicious. I had this dish at Ba Shan in Soho (disappointing, in case you were wondering) and yours looks even better. I have some shredded spring greens which I think would make a nice alternative. Spring green may be a bit tough. Do remove the hard stem and shred very fine. I am definitely trying this. Could you post a picture of the packet of noodles raw? I am forever using the wrong noodles. Hi Liz I will do that later. Sorry a bit late Liz. Have inserted a picture as requested. Thanks for the picture. They're what i've got. They always end up all over the kitchen when i get them out of the packet! Why I always like to get the multipacks. To avoid the mess, take it out of the packet or split it inside a carrier bag less mess.